Code consulting and fire engineering to assist in ignition control to reduce fires, fuel load balancing to limit hazards, fire detection systems for early detection, fire alarm systems for notification to occupants and emergency responders, compartmentation to limit fire/smoke spread, suppression systems to control fire development, smoke management to restrict the development and movement of smoke, fire fighting facilities to assist in suppression activities. Developing and implementing effective disaster prevention, preparedness, response and recovery plans before a disaster occurs to limit loss of life and property damage, and help ensure appropriate and effective actions are taken. Building a thorough understanding of goals and functional objectives, identifying credible hazards, understanding of a structure’s unique characteristics and significance of collections, under-taking risk assessments to understand the vulnerability and susceptibility to credible hazards. 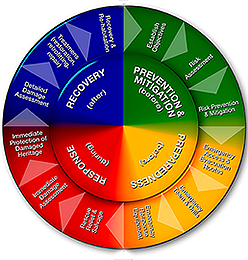 Developing emergency evacuation plans and procedures; creating emergency response teams; conducting training and drills; working closely with emergency responders; and identifying and locating appropriate emergency response and recovery related resources and equipment that may be needed post disaster. Developing disaster response plans including search and rescue, salvage of heritage/historic site, collections and artifacts, preliminary damage assessment and immediate protection and stabilization of the damaged site and collections. Planning for detailed damage and structural assessments; treatment of collections and damaged heritage sites including repairs, restoration, retrofitting, rehabilitation activities; through re-occupancy of the site. Engaging in education and training activities for people in the cultural heritage and disaster management industries, including historic site operators, caretakers, craftspeople, and designers. These activities includes site visits, lectures at local and international conferences, developing easy to understand guides, and developing interactive and informative web pages to help educate people as to how we can better protect our cultural heritage. Strengthening skills and knowledge levels of individuals and local communities in understanding hazards, vulnerabilities, disaster management options, and incorporating local resources to achieve desired results. Local individuals and communities are critical to a successful, long term sustainable disaster management plan for preserving their cultural heritage. Capacity building is often through the development of interactive training programs, training local people to train others, and both short and long term training programs.